As a writer, amateur sketcher and wannabe singer, I find myself enthralled by people who successfully develop their artistic gifts in multiple areas. With that confession, my enthusiasm regarding Dimitrea Tokunbo will come as no surprise. Dimitrea is an author, illustrator, mural painter, graphic designer, and full-time mom. She studied illustration at the Moore College of Art for Women (now the Moore College of Art and Design) based in Philadelphia, PA. 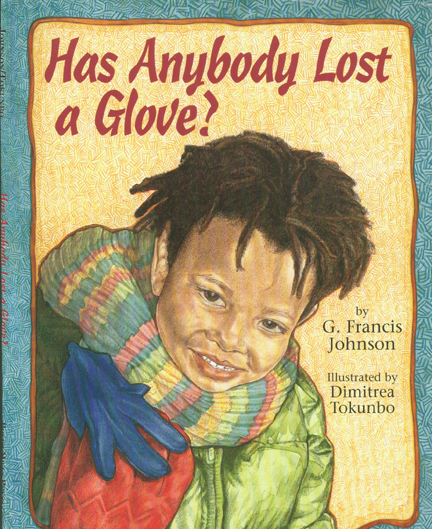 Her authored titles include The Sound of Kwanzaa (Scholastic, Inc.); her illustrated works are Amadi’s Snowman (Tilbury House), Sidewalk Chalk: Poems of the City , and Has Anybody Lost a Glove? (Boyds Mills Press). A New Yorker who takes pride in her multicultural heritage and two talented daughters, Dimitrea describes herself as “a dreamer whose quiet steps savor the glory and stillness of manicured gardens, glistening fountains, and ivy-covered castles…[and] a singer whose clapping hands carry the tropical song of steel drums, bongos, and tambourines.” As we approach the end of this year’s 28 Days Later campaign, it’s my pleasure to be able to share with you the immense talent and creativity of Dimitrea Tokunbo. BBS: Welcome to The Brown Bookshelf, Dimitrea. DT: I am thrilled and honored. Thank you for having me. DT: My first paying gig was as an illustrator. I was a freshman at Moore College of Art for Women when I was recruited do some artwork for WDAS in Philadelphia. BBS: What about your mural work? Do you still do them? Where can some of your murals be found? DT: Unfortunately none of my early murals exist anymore, but I have just begun the process of volunteering with a group named Groundswell. Groundswell is a non profit organization that connects professional artists with city kids to do murals in the community. 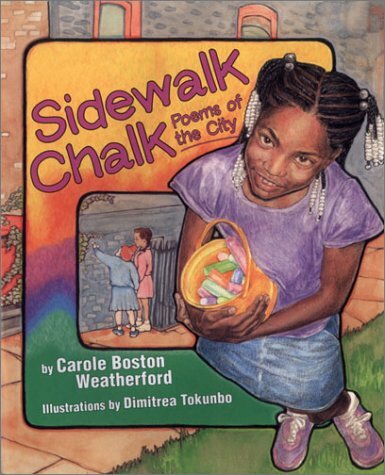 BBS: Speaking of city kids, the first picture book you illustrated was called Sidewalk Chalk: Poems of the City. What’s the story behind your getting involved with the project? How did you go about tackling this new challenge practically/artistically/ emotionally? DT: Well, I got the Sidewalk Chalk project after attending the Chautauqua Children’s Book Writers and Illustrators conference sponsored by the Highlights Foundation. I was able to go because I was awarded a full scholarship. I felt like Cinderella. I had a mentor and an advisor for a manuscript I’d submitted. I got to meet and make friends with the staff at Boyds Mills Press. It was magical. When I got home from the conference, the publisher called me and asked if I was interested in doing the project. Of course, I said yes. I called my mentor from the conference, who happened to be married to a seasoned illustrator. Together, they gave me support through my first book. 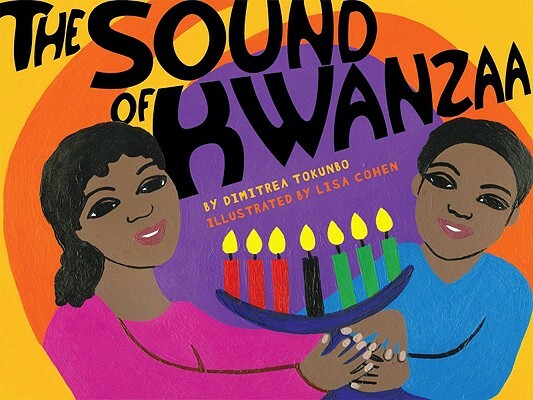 BBS: The Sound of Kwanzaa is your latest picture book. What’s the backstory regarding your inspiration for this one? How did you decide to add writing to your creative portfolio? DT: When I moved to Brooklyn, almost ten years ago now, a good friend of mine invited my daughters and I to celebrate the last day of Kwanzaa at her family’s Karamu (Swahili name for “party for feast”). It became a time we looked forward to each winter. I was coming home from a poetry slam when I imagined a Griot calling the children around to pass down the traditions of Kwanzaa. It was my effort to distill the explanation of Kwanzaa into the simplest terms I could think of while still allowing my love of poetry to play out. 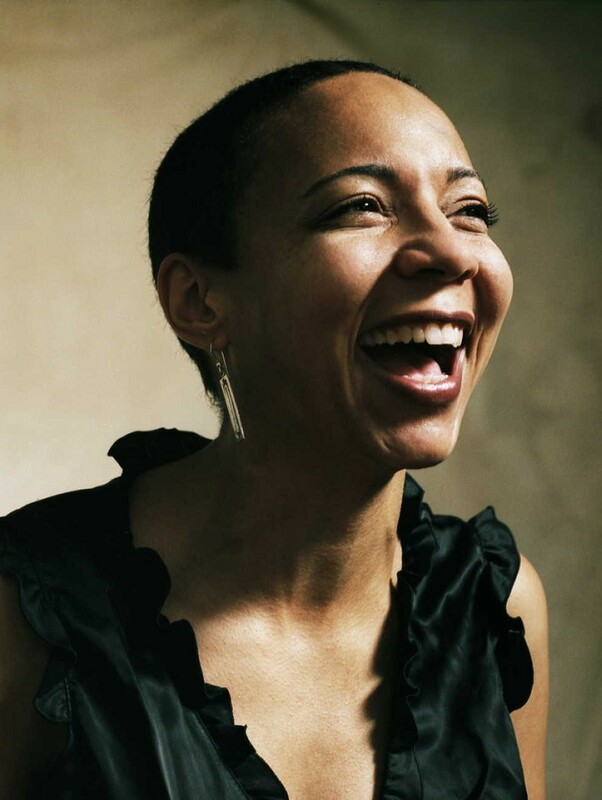 Phillis Wheatly, the first African American to have a book published, was the catalyst to my writing career. I was touched by her story in elementary school. When I got to college, my new best friend reminded me of Phillis Wheatley. We promised each other when we grew up, we would write a children’s book about her together. We gave it our best shot but when it didn’t get published we almost gave up…I couldn’t let the project die. I went to library and started reading how to books for writing and illustrating children’s books. I didn’t really know if I could do it. I just closed my eyes and tried to imagine what it would be like to be Phillis Wheatly. The manuscript I wrote is what won that Highlights scholarship I told you about earlier. 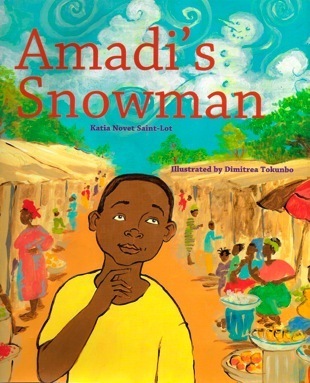 So actually it was my writing that opened the door for me to illustrate children’s books. I am actually still working on that manuscript! BBS: You now have several picture books under your belt, three as illustrator and two as author. I know you must love both forms of artistic expression, but do you find one more difficult to accomplish than the other? DT: Actually I love to do both and ideas flow or are blocked with equal measure in both areas. I find that when I am engaged in my creativity–singing, dancing, socializing with other artistic people (whatever the genre)–I am inspired and I have no problem producing. My latest passion is face painting. In the summer time you can find me at the zoo where I am turning children and adults into tigers, alligators and butterflies! BBS: Most (if not all) writers of children’s literature are influenced by various aspects of their childhood as they pen their stories. How would you say your upbringing influences the stories you write, the art you create? DT: I think having a culturally diverse heritage has had a great influence on what I create. I love the manicured gardens, bagpipes and quilts from my mother’s European lineage and the vibrant textiles, sculpture and drums of my father’s African ancestry. Growing up in diverse communities for most of my live, I have been influenced by the melting pot of New York. BBS: You had one of those cool moms who supported your passion for art unconditionally, even letting you draw pictures on your bedroom walls (gasp!). Tell us what her early encouragement meant to you then…and what fruit it is still bearing within you today. DT: My mother is an amazing artist herself. Being around her and watching her create gave me a great role model in the arts and in appreciating art. The fruit is that I have been able to do the same with my children. I have two amazingly artistic daughters who surprise me with new ways of expressing themselves. BBS: In who/what/where can your creative muse be found? DT: I love history. People’s stories are so fascinating to me. People tell their stories in so many ways. They sing their stories, they dance their stories, they paint their stories. A good story will set my gears in motion to share the stories I’ve got in me too. BBS: Why children’s books, Dimitrea? DT: I love the format for expansive illustrations and the simplicity of straight-forward story telling that make excellent children’s books. I have to say, although I haven’t done one yet, I also love graphic novels for that very same reason. BBS: What projects are you currently working on? DT: I am working a few picture book biographies…and I am in the process of divising a plan to become a rock star (sssshhhh, that will be our secret). BBS: (Don’t worry. I’ll keep it quiet.) In spite of growing up with the challenge of dyslexia, you ultimately learned to love the written word. What or who helped you in your journey? What can we—artists, educators, media specialists, parents—do to encourage the reluctant readers of today in theirs? DT: I have a team of people to thank for my educational achievements. My mother never stressed me about what I had trouble accomplishing, she focused on the things I could do well. She recognized my love of color and provided me with plenty of opportunity to exercise that love. My break through with reading came when I was about 13. My cousin, Mary Alice, asked me to read her some pages of Harriet the Spy (a book she’d given to me as a gift). The book had so many pages and the words seemed so small that I got all jumbled and frustrated and embarrassed as I tried to read to her. She was really patient, and then she said to go slowly… as slowly as I wanted. She said no one needed to know why I am reading slowly. It could appear as confidence to others. The idea of tricking people made it fun. When I took my time, it seemed the letters untangled. That summer I read my first YA cover to cover. It was Zeely by Virginia Hamilton. I actually didn’t start loving to read aloud until I had children. I read easily 15 to 20 children’s books a day for years. They loved how slowly I read, and I loved entertaining them. BBS: Now. Regarding the weightier matters of life: Skittles or M&Ms? DT: When I was a kid it would have been Skittles. When I was in College it was M&Ms but now its Fine & Raw Chocolate (non-dairy and sweetened with Agave) made in Brooklyn. DT: Definitely Pictionary though I come from a family of fierce Scrabble players. My mom has the fancy Scrabble set that spins! BBS: You’ve travelled back in time to the one place you’ve always wished you could. Where are you? Is it a re-experience or a do-over? DT: That’s a tough one. I have recently been making peace with leaving my past behind so I can focus on this amazing adventure unfolding around me right now. BBS: I hear you. Dimitrea, thanks so much for being with us today! DT: You are so welcome. Thank you, again, for having me.